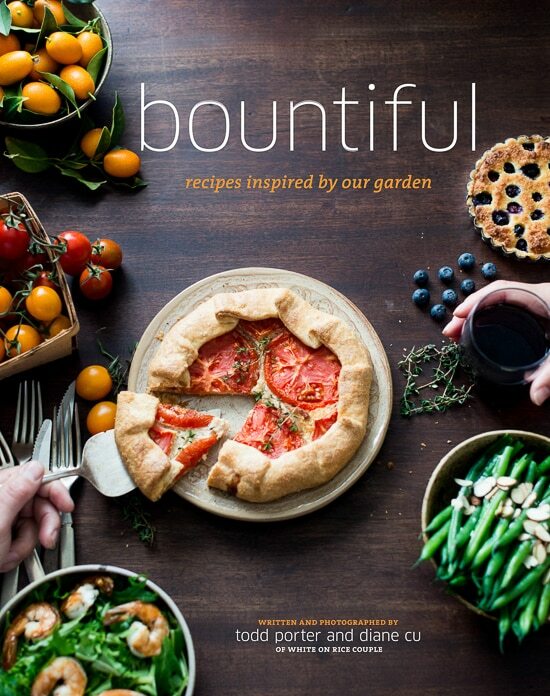 It’s pretty clear about our love of brussels sprouts. Over the years we’ve added to our extensive collection of brussels sprouts recipes and thought we’d be satisfied for a while. 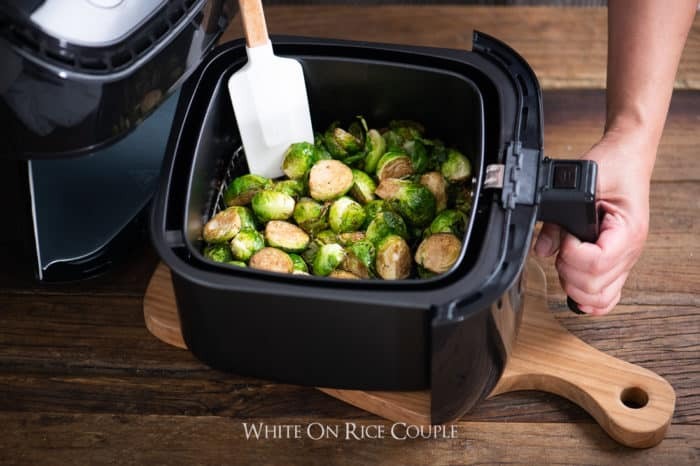 Now we have a new one to add: Air fried brussels sprouts in the air fryer. And it’s a tremendous revelation! First of all, we have to be honest about our initial judgments of air fryers. We have a great double oven that we use for roasting and stove top for deep frying. 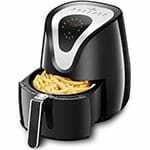 So adding another air fryer or for that matter, any appliance felt like an overload of tools. Second of all, an air fryer just felt like an unnecessary “As Seen On TV” gadget that usually ends up at the garage sale. But with so much talk about air fryers over the last few years, we had to finally give it a try. Now as a result, our minds are blown and totally humbled about our previous air fryer judgments. 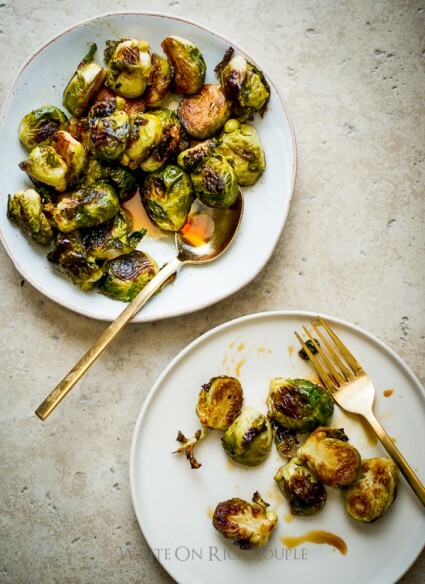 These air fried brussels sprouts come out so fantastic, perfectly crispy and oh soooo good. 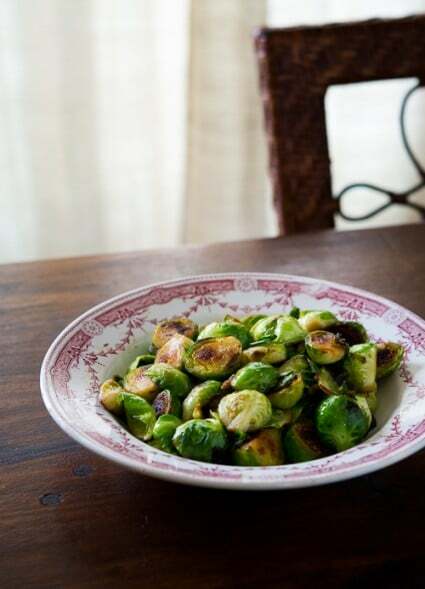 Our classic brussels sprouts recipe with balsamic vinegar is our go-to oven roasted holiday brussels sprouts dish. 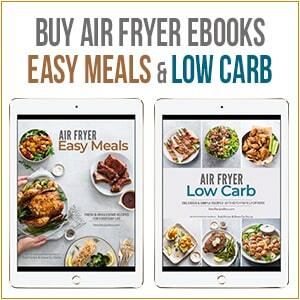 We made this recipe in the air fryer with much less oil. The results were just as delicious and super crispy without all the oil. 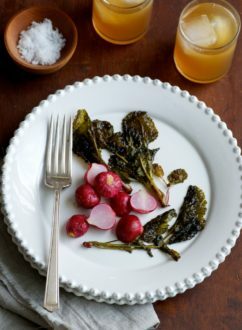 The texture was like a perfectly roasted brussels sprout. 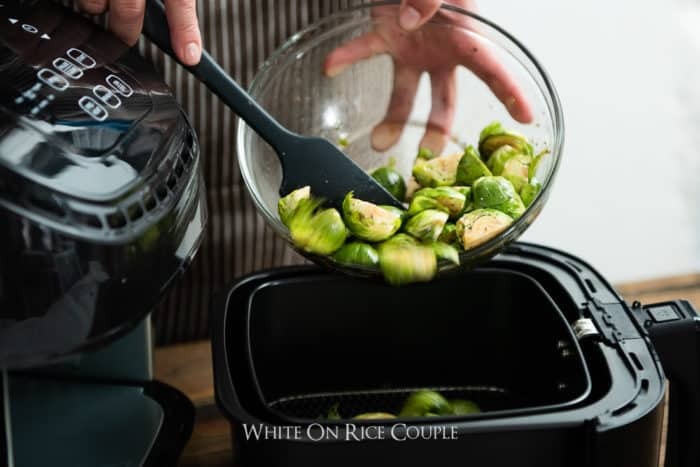 We’ll definitely consider making our brussels sprouts in the air fryer for the holidays when we’re in need of more oven space. Now we can dedicate our ovens to the turkey, potatoes and desserts. 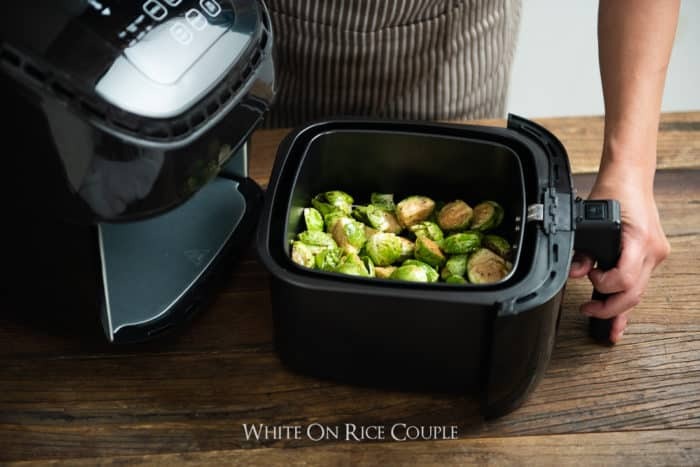 The air fryer can now handle all the brussels sprouts dishes! We barely have to use any oil for cooking in the air fryer and the food comes out crispy and perfectly cooked. Air fryers are basically like mini counter top convection ovens with a heating element on top of the food. As it generates heat, a fan circulates the hot air to help the food cook evenly and crispy. The texture is similar to deep frying without having to use a ton of oil or fat. In fact, we barely use any oil or no oil and the food still comes out crispy and delicious. 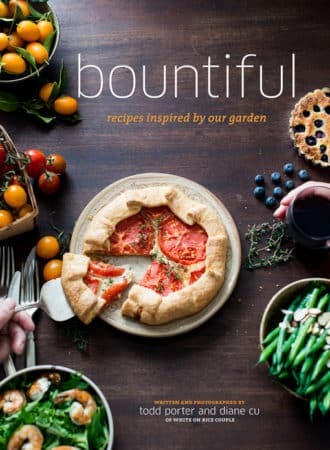 Most food also comes out like it’s perfectly roasted in a convection oven. Healthier way to cooking fried foods. Overall, much less use of oil. There’s little clean up and less of oil while cooking. Great for cooking frozen foods without oil and great for re-heating foods. You really can’t cook big servings of food unless you buy the larger air fryers or cook in multiple batches. They aren’t cheap and some can be more hassle to clean, depending on the design and model. 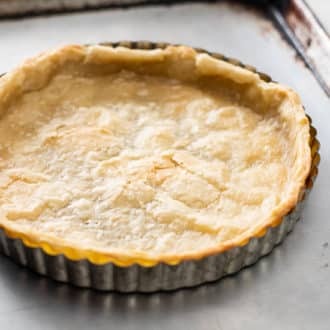 If you already have a little countertop convection oven and love it, you might want to stick to that, unless you’re into really low oil cooking. Don’t over crowd the baskets with food. Cook in batches if you need to (2 small-medium batches cook better than 1 large batch). Don’t forget to shake while cooking, but sometimes shaking the basket during cooking isn’t enough. 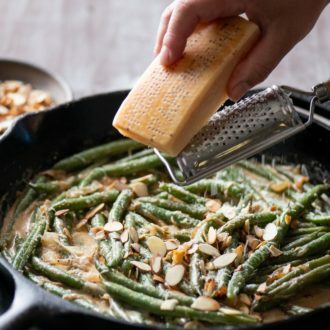 Gently toss the food with a rubber spatula so food doesn’t break or tear. The bottom of the air fryers can get hot while cooking. Make sure to place on a heat-safe surface or wooded cutting board. We have ten different air fryers, all different brands and we definitely have our favorites. Size matters, especially if you’re needing to feed a family of four to six hungry people. We’re mostly cooking for two during the busy weeknights and the 3 qt size fryers is great for us. 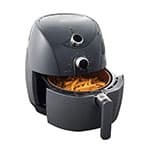 If you’re wondering what size of air fryer to get our recommendation is the 3-4 qt sizes for 2-3 people (or if you don’t mind cooking multiple batches) and the 5-6 qt for families of 4-6 (you’ll still cook somethings in batches, but not as much as the smaller air fryers). Tidylife 4.2 qt Digital Air Fryer – This is our favorite one to cook for 2-3 people. Texture for several dishes came out noticeably better than other brands. We love the non-stick basket style (non-wire base) & smoothness of the basket tray (makes for easy cleanup). NuWave Brio 3 qt. 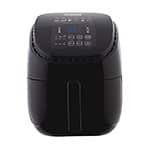 Digital Air Fryer – We liked the NuWave Air Fryer too, just not quite as much as some of the other’s we’ve used. The basket has wire base (which we found sticks a bit more) and it doesn’t have the 1/2 way reminder beep of some other brands, however still cooks great. It does have a lower temperature ability, allowing for more cooking options. The buttons are easier to see than on the some of the other’s we’ve tested. 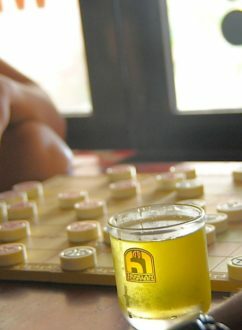 Tiluxury 5.8 qt. 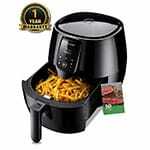 Digital Air Fryer – This is a good larger air fryer. Great for cooking bigger batches (ie 4 salmon fillets instead of 2 or 2 lbs of fries instead of 1). This is a nice choice for families & hearty eaters. This 5.8 qt air fryer has the non-stick basket (non-wire base) we prefer. Makes for less sticking for delicate meals (ie baked fish fillets). Oster Copper-Infused DuraCeramic 3.3 qt. Air Fryer – We love the copper infused ceramic coating on the basket. As always, portion control is key to eating healthier so you wouldn’t want to eat a whole basket of fries even if it’s air fried. But cooking with less oil in the air frier can certainly help you eat healthier. 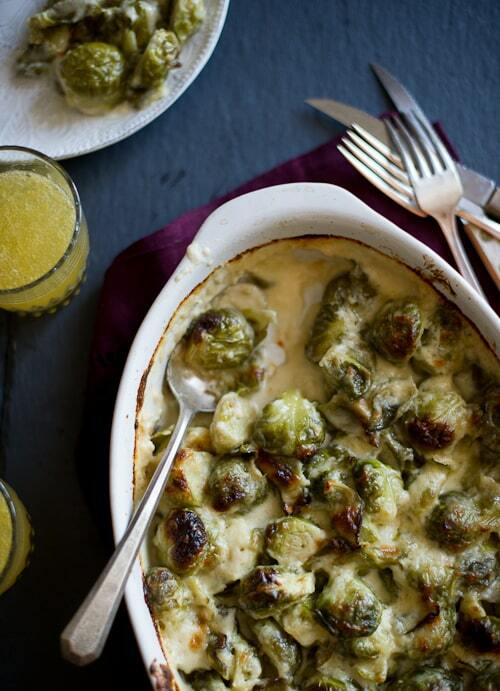 Brussels Sprouts Gratin Recipe: this is the magical recipe that has transformed so many brussels sprouts haters into lovers. The result is an addicting, creamy and tender brussels sprouts and cheese combo that can easily satisfy anyone craving mac and cheese. And it’ll be a low carb version. Not low calorie, but definitely low carb! 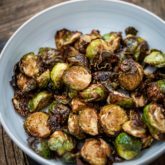 Easy Roast Brussels Sprouts Recipe: this was one of our very first recipes in 2009 and it’s continually our go-to recipe for every craving we have. 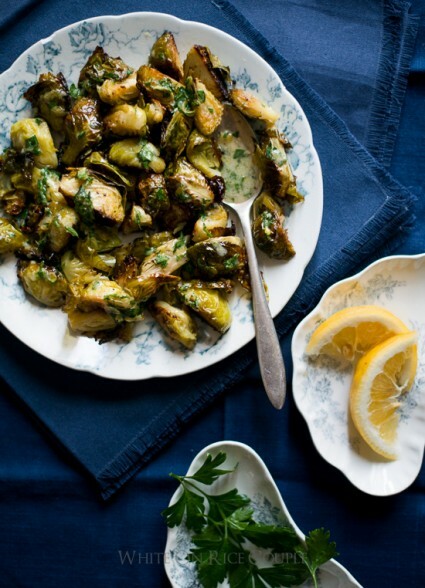 Roasted Brussels Sprouts with Lemon Parsley Dressing Recipe: another everyday favorite that’s bright with an awesome lemon dressing. Make double the amount because they’re so delicious, you might have it as a full meal. 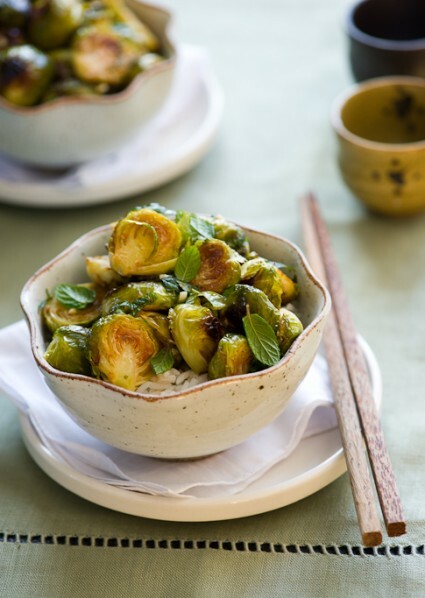 Pan Roasted Brussels Sprouts with Fish Sauce and Lime Recipe: Yes, it might sound odd– fish sauce?! Try it, the umami flavor in each bite is incredible. 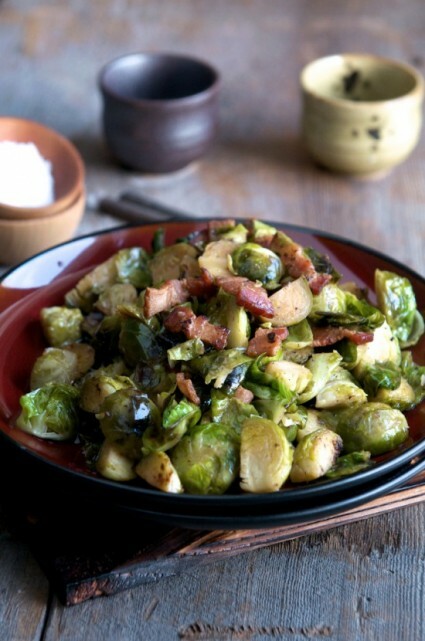 Braised Brussels Sprouts with Bacon and Shallots Recipe: An oldie but goodie because who doesn’t love bacon? and the shallots adds awesome flavor. Cheesy Baked Brussels Sprouts with Parmesan and Onion – a popular rendition of our sweet onion crack dip, but with a few brussels sprouts thrown in! Roasted Brussels Sprouts with Sriracha and Mint Recipe: A spicy sauce for all you sriracha lovers. And it’s flowing over a ton of brussels sprouts. Yum. 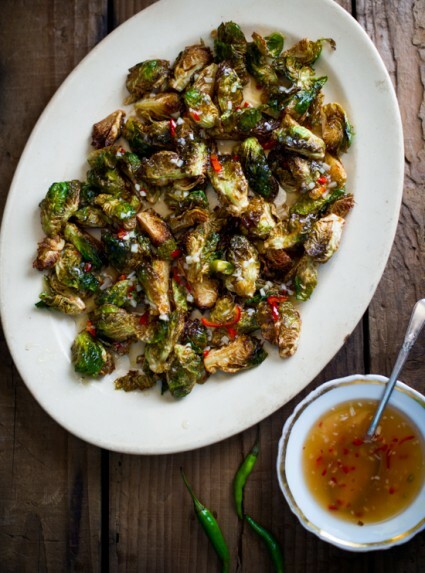 Crispy Brussels Sprouts with Mom’s Chili Fish Sauce– a recipe with a Vietnamese twist to delicious fried brussels sprouts. To die for! 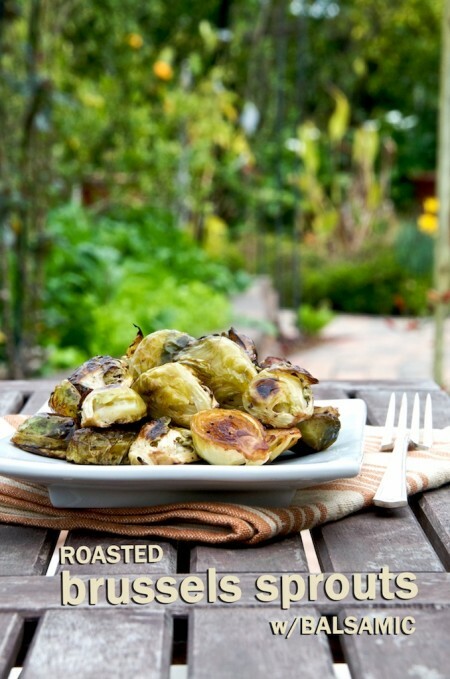 Teriyaki Glazed Roasted Brussels Sprouts Recipe: We love sauce, can you tell? Here’s a fabulous teriyaki glazed beauty to make these veggies amazing. 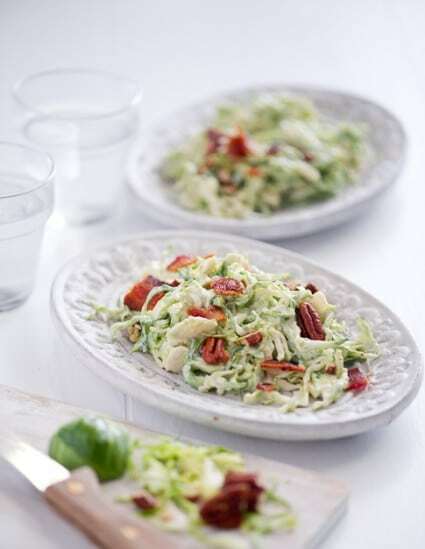 Shaved Brussels Sprouts Slaw with Bacon and Pecans: a raw take on the brussels sprouts and it’s a wonderful salad with salty bacon and crunchy pecans. 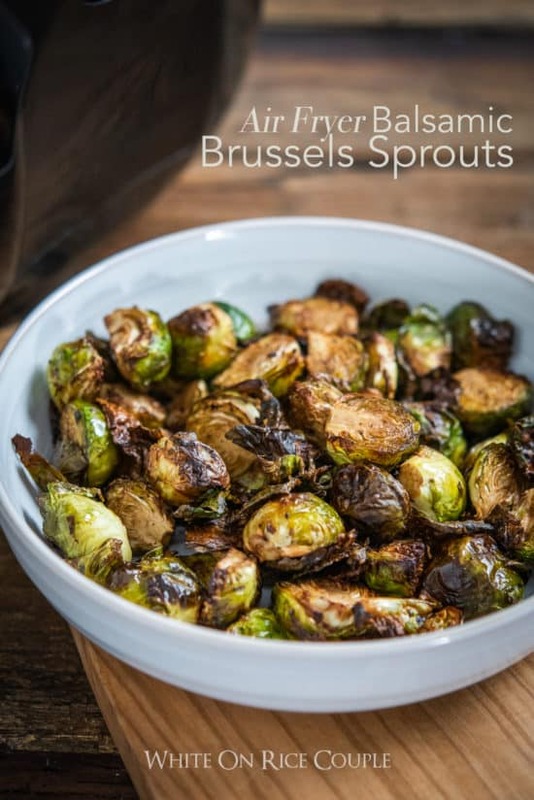 Hope you enjoy our collection of brussels sprouts recipes over the years and here’s another great batch to try. Enjoy! Cooking times will vary depending on the size of brussels sprouts. 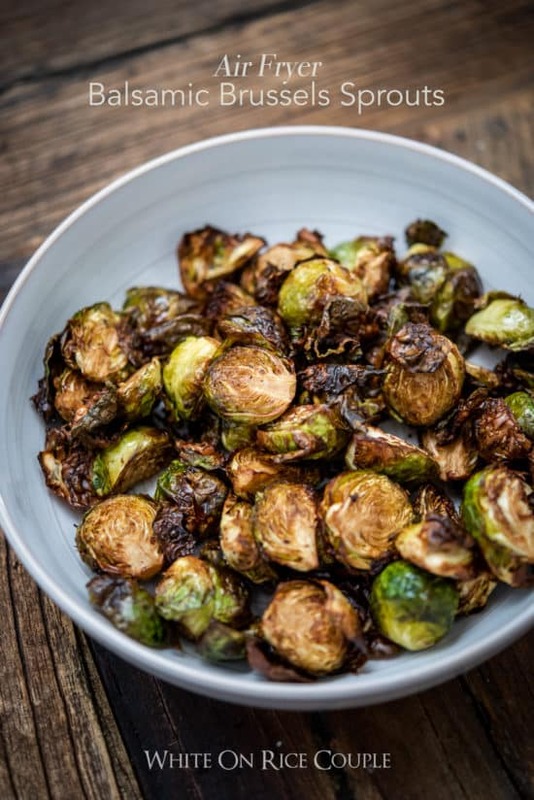 We like our brussels sprouts brown, crispy and tender. For small to medium brussels sprouts, cut them in half. If they’re larger, then cut them into thirds. Most importantly, try to buy them in all the same size for consistent cooking. Put cut brussels sprouts to bowl. Drizzle oil and balsamic vinegar evenly over the brussels sprouts. Don’t dump the oil and vinegar in one spot or else it will just coat one brussels sprout. 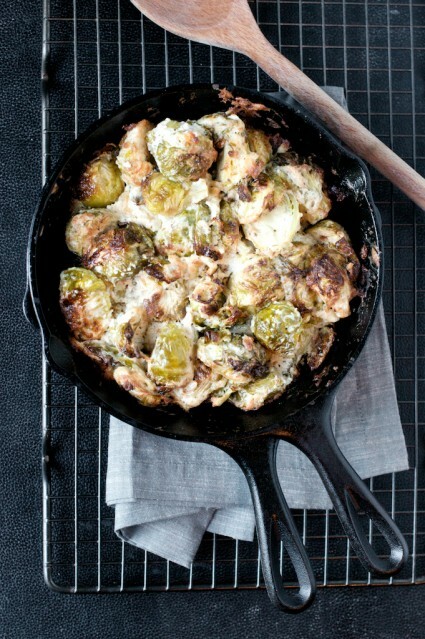 You want to make sure to coat all the brussels sprouts. Sprinkle salt and pepper evenly over the brussels sprouts. Stir to combine everything and long enough so that all the brussels sprouts soaks up the marinade. There shouldn’t be any marinade left in the bottom of the bowl. 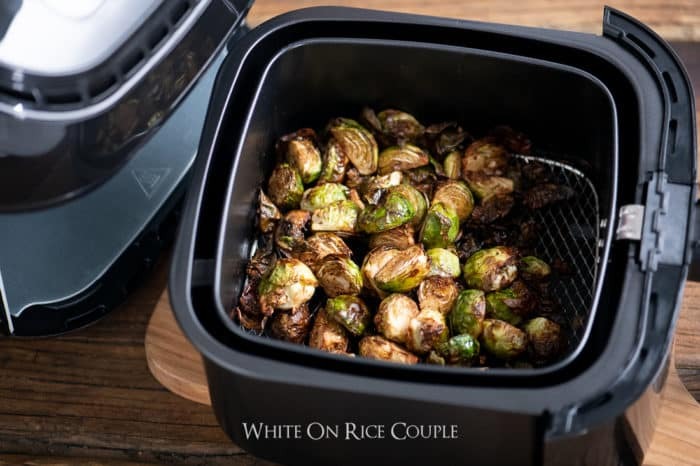 Add brussels to the air fryer basket. Air fry at 360°F for about 15 minutes. Shake and gently stir half way through, about 8 minutes into cooking. Make sure you shake at the halfway mark! You don’t wan to end up with uneven cooking. Continue to air fry the brussels for the remainder of the time, or until the brussels are golden brown and cooked through. You can check earlier if needed to make sure nothing burns. Or you can add more time if needed to make sure it’s cooked through. 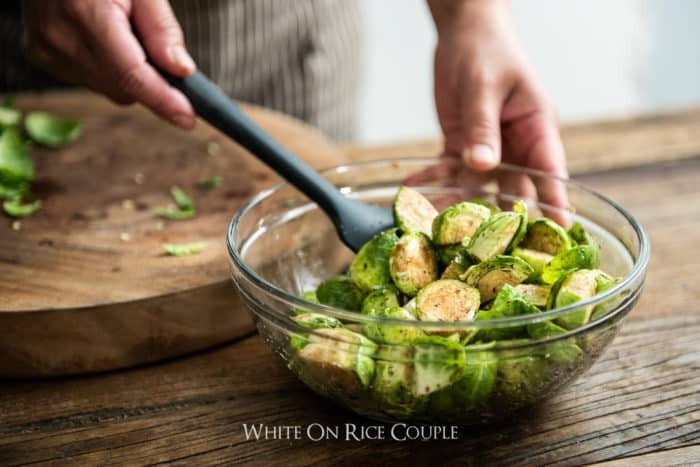 Add additional salt and pepper if needed on the brussels sprouts and enjoy! Don’t crowd the basket. If needed, it’s better to cook in multiple smaller batches for even cooking, than it is to cook in one large batch. If cooking in multiple batches, the first batch will take longer to cook if Air Fryer is not already pre-heated. If you decide to double the recipe, it will work great but make sure your air fryer is large enough (this recipe was cooked in a 3.8 qt air fryer). You might need add an additional 1-2 minutes of cooking time and give an extra shake or two while cooking if the basket is fairly full. This was much easier to cook on the air fryer! My carnivorous husband is now a huge fan of brussels sprouts. I can’t believe it! Hi Letty! that’s awesome your husband is eating his veggies! We always have no oven room left during thanksgiving. 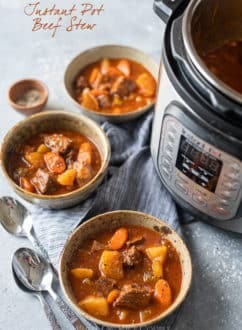 So tried this recipe and it was even better in the air fryer than it would have been in the oven! Great recipe. Hi Cindy! That’s awesome to know these were a hit and made Thanksgiving planning a little easier for you! I was leary at how little oil the recipe needed and added double the oil. They were great and realized it would have still been great with less oil. SO GOOD! It’s always surprising to know how little oil you need! You have no idea how good I looked when I put these out for dinner. Everyone that it came from a restaurant because they were perfectly crispy and wonderful. Thanks! Ha, don’t tell anyone what your secret cooking weapon is. 😉 Air fryers are awesome. These were perfectly crispy and amazing! Can’t believe i hardly had to use any oil! That’s awesome you enjoyed it Joanie! We’re obsessed with how healthy and crispy they are.